Fear the bite of Pac-Man! 8-bit hard enamel pins you can wear or display! Look for Pac-Man, Blinky, Pinky, Inky, Clyde, Apple, Melon, Bell, and more. Plus a lenticular Blue Ghost that turns to White Ghost! Case contains 28 collectible pins. 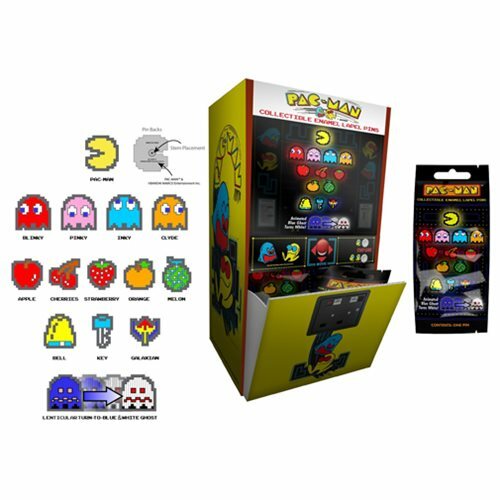 Once again, fear the bite of the infamous Pac-Man in this retro arcade cabinet-themed, gravity-fed, super-collectible, hard enamel pin display by CMD Collectibles! Your favorite characters are featured in their 8-bit style from the classic video game, and each pin comes in blind packaging. Collect them all! Ages 8 and up.